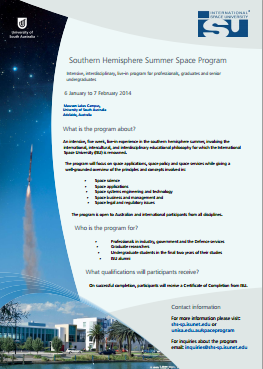 ISU Southern Hemisphere Summer Space Program | Space Agenda, The space related events calendar! The Southern Hemisphere Summer Space Program (SHS-SP) is ISU’s newest annual program offering, provided in partnership by ISU and the University of South Australia. The program is designed with a particular eye to the southern hemisphere environment and is built around the themes of space applications, space policy and space services, while giving a well rounded exposure to the principles and concepts involved in space science, space systems engineering and technology, space business and leadership and space legal and regulatory issues. In 2014, ISU will also be offering two unique short courses in cooperation with the University of South Australia (UniSA) immediately following the SHSSP14 session. The first course addresses modern spectrum management and the second addresses strategic space law.